Day 3 of the Â£10,000 + 350 Main Event concluded with 22 players remaining, playing down to the final table starting at 12pm London time Monday afternoon. A reminder, a stream with hole cards (plus 5 hour delay) will be available at ESPN3.com in the US, Latin America, Brazil, New Sealand and Australia. The same stream will be available at WSOP.com for European viewers. The chip leader is Ronald Lee with 922,000 in chips. Other notables returning: Andrew Pantling (Event #1 runner-up to Phil Laak) – 821,000, Viktor Blom – 705,000, Phil Ivey – 657,000, Hoyt Corkins – 566,000, Barny Boatman – 379,000, Victory Poker CEO Dan Fleyshman – 336,000 and Roland de Wolfe – 113,000. Table draw available at WSOP.com . PokerStars LAPT Grand Final – Rosario, Argentina :: Martin Sansour defeats Bolivar Palacios, earning $322,280. Matthias Habernig’s bid for back-to-back LAPT wins fell short, finishing 6th. PokerStars Blog has the final table report. TJ Cloutier Choctaw Poker Classic – Durant, OK :: Cloutier finishes 17th for $3,673, play down to 4-handed. www.roundersradio.com covering the FT action. JP Kelly fell ohsoclose of winning his 3rd WSOP bracelet in Event #3 – Â£1,000 + 75 NL Holdem, finishing 2nd to Scott Shelley, an employee at online poker site PKR, who won his seat in an office freeroll*. Shelley earned Â£133,857 for the win, while Kelly pocketed Â£82,854 for the runner-up finish. Full results available at WSOP.com. * Credit to Chris Hall of PokerNews. Day 1 of the Â£10,350 No-Limit Hold’em High Roller Heads-Up drew a field of 103 players, with the winner earning a coveted WSOPE gold bracelet along with Â£288,409. Round 2 action has concluded with 32 players returning with three more rounds of play starting Wednesday afternoon at 3pm. Among the players who made it to Wednesday action: Phil Ivey, Scott Fischman, Mori Eskandani, Andrew Feldman, Andrew Robl and Shawn Buchanan. The draw for round 3 is available at WSOP.com. In another “good for poker” moment, Phil “The Unabomber” Laak took down his first WSOP bracelet, defeating Andrew Pantling heads-up to win the Â£2500 + 150 NL Holdem 6-max event, earning Â£170,802 and the coveted gold bracelet. Laak now has three top-18 finishes in Europe since his August ATV accident. Pantling collects Â£105,506 for the runner-up finish with Chris Bjorin picking up Â£70,473 for third place. Full results and Nolan Dalla’s tournament report forthcoming at wsop.com. Event #2, Â£5,000 + 250 Pot-Limit Omaha, drew a field of 120 entrants with the top 18 making the money and a first place prize of Â£159,154 by Friday evening. Updates available over at PokerNews and WSOP.com Friday at 12pm, day 1a of the Â£1,000 + 75 NL Holdem kicks off, the first of three opening days. Last year’s winner was JP Kelly, the second player to win a WSOP and WSOPE bracelet in the same year, besting a field of 608 players to earn over Â£136,000. Day 2 of PokerStars APPT Auckland gets underway with 96 of the original 218 players returning for a $123,000+ first place prize. PokerNews and the PokerStars blog are handling the update duties. Day 1b of the $335 Commerce Guaranteed Million Dollar Tournament drew a field of 563 players Tuesday afternoon, with James Pittman (victim of one of Phil Hellmuth’s classic rants, shown below) led the field with 311,500 in chips. 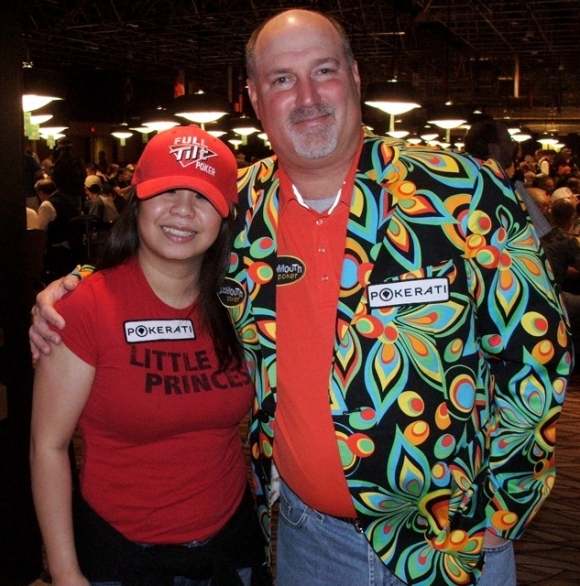 Other notables returning Sunday include Michael Woo (101,500) and Mike Souza (89,500). Notables who earned money but who can try again for a top 27 finish include Internet entrepreneur Jason Calacanis, 2010 WSOP bracelet winner Hoai Pham. Play on Sunday for the 135 players remaining will resume at the earliest level that play ended on the opening days. At this time, day 1b has ended the soonest, on level 16 (1500/3000 with a 500 ante). The full results for day 1b can be found here. NOTE: Registration for day 1c will reopen Tuesday at 4:40pm PT, while registration for day 1d reopens Wednesday at 4:40pm PT. Day 1a of the Main Event got underway after Greg Raymer gave the command to “shuffle up and deal” shortly after 12pm on Monday to the 1,125 player throng, mostly seated in the Amazon room. The Pavilion room had a few tables at the start, but they were the first to be broken and moved into the Amazon room. Raymer was the first big name to be eliminated yesterday, crippled when he moved in with a flush draw against his opponent’s flopped set of tens. The flush didn’t get there, and he was gone a few hands later. During the day he would be followed out the door by notables such as T.J. Cloutier, Victor Ramdin, Isaac Haxton, Chino Rheem, Nick Schulman, Mike Caro, Ray Romano, Billy Baxter and Jimmy Fricke. When play ended in the middle of level five, 762 players will return Friday afternoon for day 2a with the survivors from Wednesday’s day 1c field. The day 1a leader is British pro James Mitchell Corwin Cole with 241,075 228,200 in chips. Michael Mizrachi is 4th in chips with 142,650, with others near the top of the leaderboard including Barry Shulman (113,325), Chris Moneymaker (107,425), John Hennigan (95,050), Maria Ho (90,700), Scott Seiver (80,100), Vince Van Patten (75,450) Dwyte Pilgrim (68,775), Lacey Jones (67,600), Rene Angelil (52,275) and Matt Glantz (44,000) . The full list of chip counts is now available at wsop.com. Today’s 1b field will bring another crowd of 1,000+ players to the Rio, each holding their $10,000 lottery ticket, hoping for a big payday. Follow all the updates, chip counts and other excitement over at wsop.com, or follow Dan’s lists of Twitterers. The final $1,000 No-Limit Holdem of this year’s WSOP was won by the Netherlands Marcel Vonk as he defeated David Peters heads-up, earning $570,960. Peters earned $350,803 for his runner-up finish, with England’s Paul Kerr in third for $255,076. Full results and Nolan Dalla’s tournament report at wsop.com. The $2,500 No-Limit Holdem came to an end earlier this morning with Tomer Berda with holding all the chips as he overcame a 2-1 chip deficit against Vladimir Kochelaevskiy heads-up, pocketing a cool $825,976. Kochelaevskiy will receive $510,939 for the second place finish. Full results and Dalla’s tournament report at wsop.com. Shawn “jordankickz” Busse got the better of Owen Crowe to win Event #47, $1,000 No-Limit Holdem, earning $485,791 along with the coveted WSOP gold bracelet. Crowe earned $300,494 for his runner-up finish. Full results and Nolan Dalla’s tournament report at wsop.com. The $5,000 Pot-Limit Omaha bracelet goes to Chance Kornuth, earning $508,090 in defeating Kevin Boudreau heads-up. Boudreau earns $313,792 for finishing in 2nd, while Robert Mizrachi couldn’t join his brother Michael in winning a bracelet, finishing 8th at the final table. Full results and Dalla’s report at wsop.com. Michael Linn ended up with all the chips in the final $1,500 No-Limit Holdem tournament of the WSOP, getting the better of Taylor Larkin in heads-up play to pocket $609,493 and the bracelet. Larkin has $378,905 to cushion the blow of finishing in second. Full results available at wsop.com. A field of 191 signed up for the $25,000 No-Limit Holdem 6-max event, with just 69 returning when play resumes at 2:30pm. ESPN3 (where available) will start airing a feature table at that time. Only 18 players will make the money, with the winner earning $1,315,518. The current chip leader is Alexander Gruibem with 548,000, followed by Jason Somerville with 516,600. Other notables returning include: Daniel Negreanu (407,100), John Juanda (401,300), Nick Schulman (280,000), John Duthie (256,800), Freddy Deeb (234,400), Barry Greenstein (194,800), Ivan Demidov (169,200), Erick Lindgren (154,400) and Andrew Feldman (101,600). The full table draw is available here and follow the action at wsop.com. The $1,500 Limit Holdem Shootout drew a field of 548, with the 64 winners of their table making the money, returning at 3pm to play down to the final 8. Among the winners yesterday: Chau Giang, Nam Le, Terrence Chan, Yevginey Timoshenko, Barry Shulman, Marcel Luske and Jonathan Little. The table draw for day 2 is now online, check out who’s sitting where here and follow the min-raising thrills over at wsop.com. Today is the last day where two new bracelet events get underway, starting with day 1a of the final $1,000 No-Limit Holdem starting at 12pm with the usual crowd of thousands heading to the Rio. The 5pm tournament is the $10,000 Pot-Limit Omaha Championship, won last year by Matt Graham, winning nearly $700,000 in defeating a field of 295. The only bracelet awarded Monday went to Norway’s Sigrud Eskeland, as he defeated Steve Sung heads-up to win the $2,500 Mixed Event, earning $260,497 and the prized WSOP bracelet. Scott Seiver finished in 6th for $40,175, while Todd Brunson finished in 10th for $18,045. Full results and Nolan Dalla’s tournament report at wsop.com. Manuel Davidian holds the chip lead (889,000) when day 3 of the $1,000 No-Limit Holdem resumes with the final 33 players playing down to a final table. Among the notables returning: Owen Crowe (610,000), Shawn Busse (432,000), Olivier Busquet (377,000), EPT winner Allan Baekke (274,000) and Scott Montgomery, winner of the previous 1k NL WSOP event (151,000). 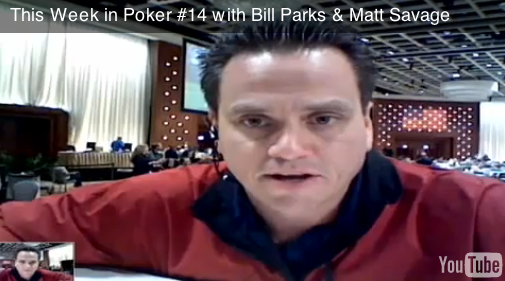 As noted in the comments, Richard Ferro finished 182nd for $2,589. Chip counts and updates starting at 2:30pm PT at wsop.com. Day two of the final $1,500 No-Limit Holdem tournament of the WSOP will have 290 players returning to the Rio at 2:30pm with Giuseppe Zarbo leading the field with 156,500 in chips. Other notables returning include George Lind (96,400), David Pham (83,300), John Myung (66,300), Shane Schleger (54,800), Liv Boeree (43,400) and Matt Matros (36,600). The day 2 table draw and chip counts are available at PokerNews. Day 2 of the $5,000 Pot-Limit Omaha resumes at 3pm with 2009 November Nine participant Kevin Schaffel leading the 172 who had chips at the end of level 8 with 178,900. Some of the returning players include Dan Shak (100,800), Annette Obrestad (73,600), Nam Le (63,000), Lex Veldhuis (52,800), Ben Grundy (48,000), Jonathan Little (41,000) and John Juanda (28,300). Full chip counts and table draw now at PokerNews. Only one tournament on today’s schedule, the $3,000 Triple Chance No-Limit Holdem event. Players start with 3,000 in chips, then get two additional “rebuy” chips, each good for another 3,000 chips to be added to their stack during the first four levels of play. Last year was the debut of this event, won last year by Jorg Peisert in defeating a field of 854 for $506,800.